benchdonkees: The other evening we went to a talk, organised by the local branch of the Bantam club, by the intrepid Gordon May about his latest adventure. The other evening we went to a talk, organised by the local branch of the Bantam club, by the intrepid Gordon May about his latest adventure. This time he's ridden a 1941 xwd Matchless G3L the 11,500 mile from his home in the UK to Vietnam. As always his talk, pictures and video clips were very informative, entertaining and enjoyable. The bike had been abandoned in Burma at the end of WW11, to ride it back through what is now called Myanmar must've been an amazing feeling! He's previously ridden a Redditch Bullet to the Enfield factory in Madras and a BSA Bantam to Egypt. I bought a copy of his latest book about the trip, of course, and tis a thoroughly enjoyable read! 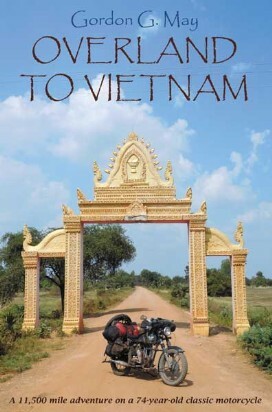 I can highly recommend the Enfield and Bantam books that tell the tales of his other motorcycle trips.